Will we stop talking about the Wii once it's released? Your guess is as good as mine. Either way, Launch Day is tomorrow (12:01AM in some places). Are you trying to pick up a brand new Wii? Let us help you. Check out the Wii Searching Doohickey. It's hardly a comprehensive solution, but it should give you an idea of which Target stores in your area you might have a shot with. Pop in your area code, and search through the list to see if anything matches up. I know Derik is trying to snag himself a Wii tonight at Walmart or something. So if you're up near Tewksbury in Massachusetts and you see his charming mug, don't forget to say hi. 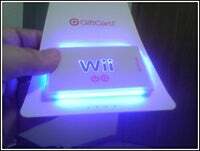 And if you can't get a Wii, you can always pick up one of these snazzy glowing Wii-themed Target gift cards.